After a late night (early morning) at the gala we slept until noon, trying to recover from the night before. Eventually I realized I was wasting my last day in the city. So, I jumped out of bed, showered, got dressed, and met up with my darling friend Aurora. We hadn't seen each other in...well...I honestly cannot remember. Aurora is one of my very dear friends from high school, we were locker buddies. 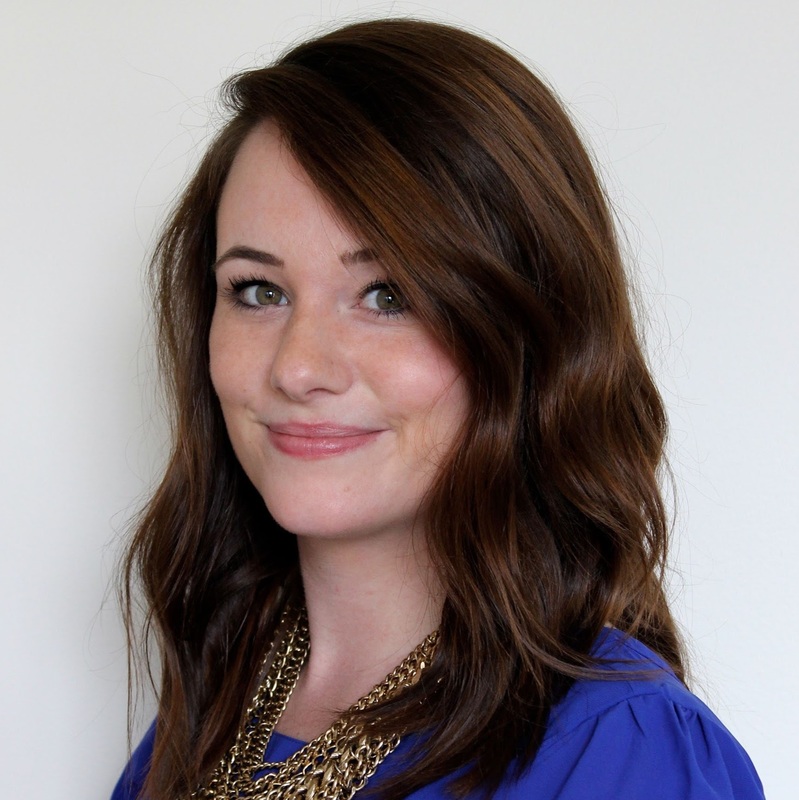 Now that she's a big girl living / working in NYC she is one very busy bee! We had planned meeting up with each other a few weeks earlier and decided we would spend our time catching up on each others lives at SMORGASBURG, which if you haven't heard of it yet...is God's gift (to this planet). Unfortunately, it was a rainy and somewhat cold day, but it didn't keep us from eating our weight in food. 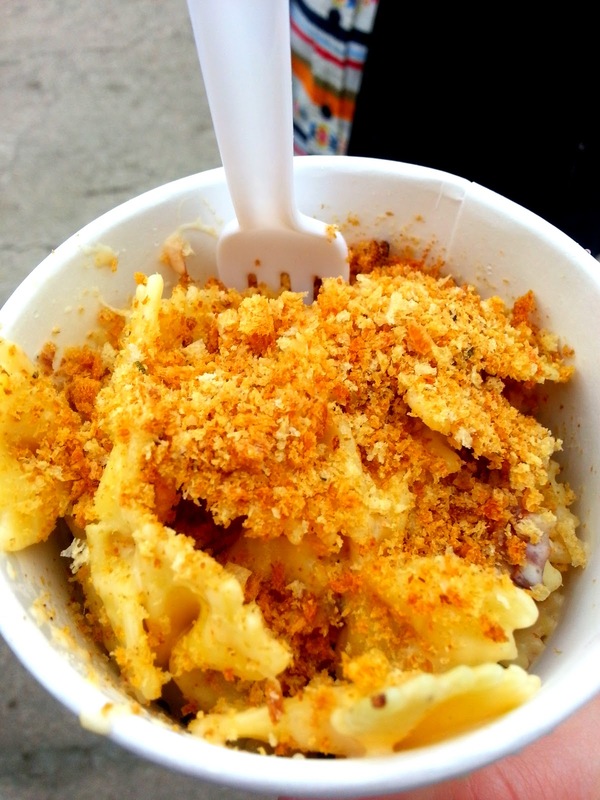 Smorgasburg is a 'Brooklyn Flea Food Market' with more food options than one could ever dream of. There are two different locations; every Saturday until September they are at the East River State Park on Kent Ave and N. 7th St. on the WIlliamsburg waterfront. 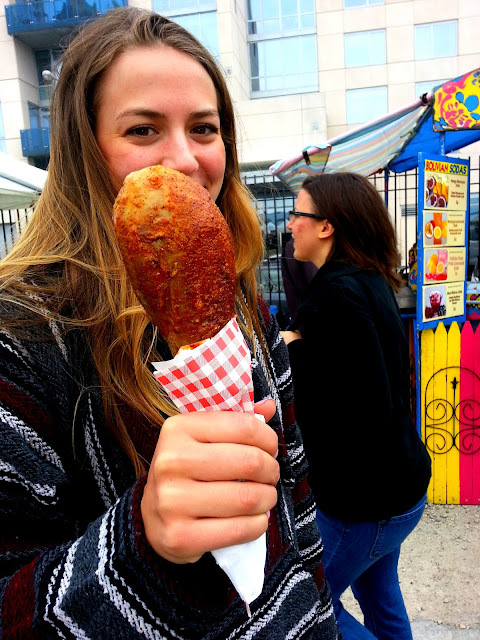 On Sundays Smorgasburg is on the DUMBO waterfront in Brooklyn Bridge Part at the historic Tobacco Warehouse. Both days the Food Mecca is open for feasting from 11 a.m. to 6 p.m.
Aurora and I met up somewhere near Union Square and took a short subway ride to Brooklyn. With a quick five minute walk we arrived and were greeted with mouthwatering smells that were coming from every direction. Seeing as how it was nearly 2pm and I had not had a single speck of food since the night before I was ravenous. We decided to take our time and browse the different stands before devouring the first thing we came across . Within the first minute I knew what I wanted to try, but agreed to take my time and stroll for options. However, Aurora was looking for one thing and one thing only. A giant turkey leg. We crossed paths with a young man thoroughly enjoying a turkey leg by himself and politely interrupted him to find out where he bought it. He pointed us in the right direction and we scurried along to wait in line. Once she found her 'must have' we made our way back to the stand I spotted in the very beginning. 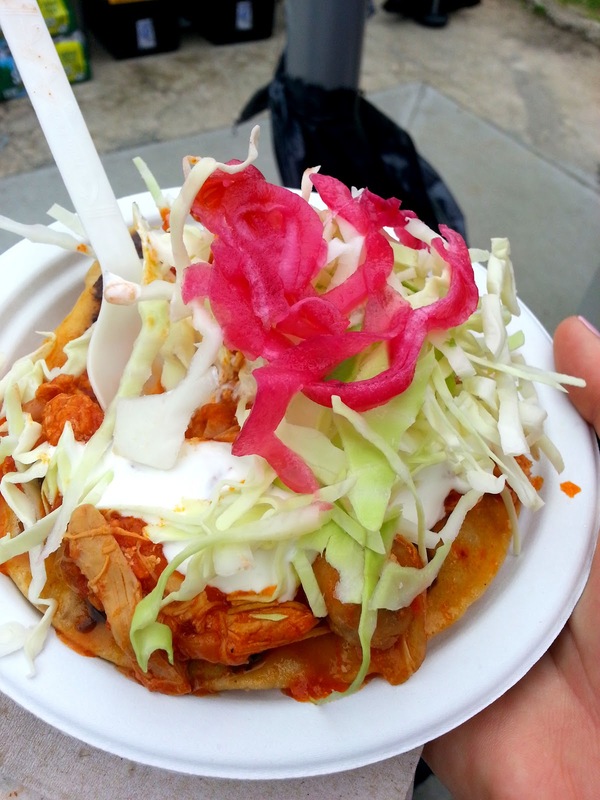 I had a chicken tostada with cabbage and pickled onions. It was amazing and exactly what I needed. The crispiness of the tortilla, the tender chicken, and the kick from the pickled onions made the perfect combination. To refresh ourselves after our first round of food, Aurora and I stopped at the THIRSTEA stand for some delicious iced tea. I had a cumquat and hibiscus tea with lychee and Aurora had a bubble tea (I forget the flavor). Next up, something sweet. We walked by a lady with a rainbow of macaroons, where I casually told Aurora I had never had a macaroon before. She gave me a look of disgust and was determined to change that. We chose three different flavors and split them. First up (my favorite) Strawberry Champagne. Not only did it match my nail polish perfectly (which was a fun coincidence) but it also became me new favorite sweet. 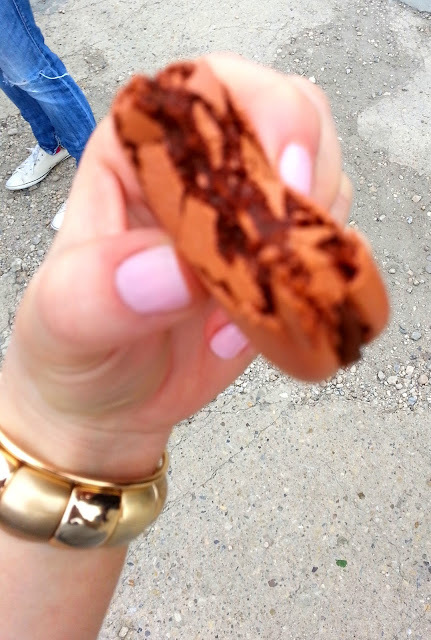 If you've had a macaroon you'd agree with me in a heart beat. It has a crisp outer shell with a soft and chewy center. The strawberry champagne macaroon brought delicious desserts to a whole new level, I now understand why I got funny looks from people when they heard about my lack of macaroon experience. This one was my least favorite. 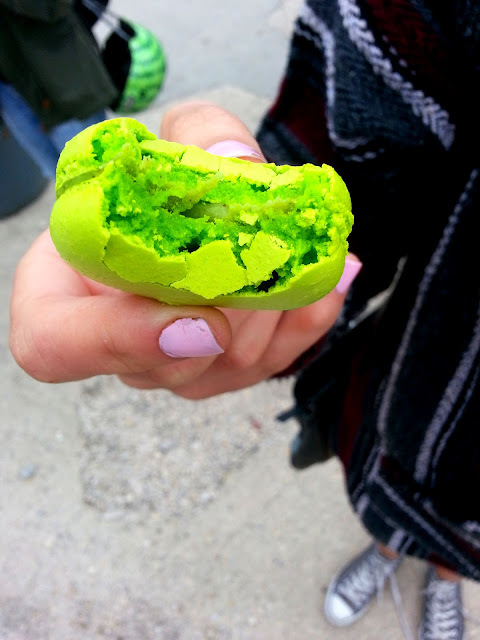 As pretty and as vibrant as it was, the pistachio macaroon was too almond-y for my liking. I didn't get enough of the pistachio flavor [maybe it's becuase I had a traumatic experience with an almond flavored sweet as a kid and I get nauseous any time I get a whiff of it]. Last, but certainly not least, Double Chocolate. [I did my very best, but for some reason my camera was not focusing correctly to take a pretty picture of this choco-mac]. Double chocolate was right, this bad boy was loaded with cocoay goodness. I just wish I had a tall glass of ice cold milk to drink after I finished. After our sweet tooth was satisfied we walked around a little longer until we came across THE MILK TRUCK. I looked up at their menu to see what was offered and got a little overwhelmed as I read over it and wanted everything they offered! Aurora ended up ordering their malted milk shake, which looked absolutely delicious and a grilled cheese sammy with bacon. It was golden and crispy. and just look at that piece of bacon! I'm a sucker for mac & cheese, so I ordered a small bowl with some double smoked bacon for myself. 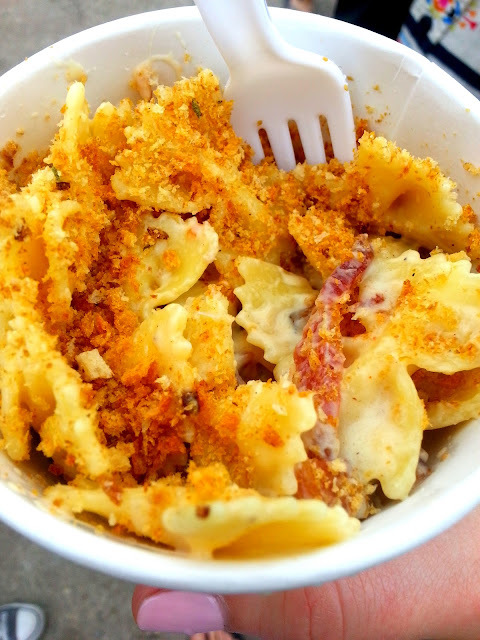 The mac & cheese was pretty good; rich and creamy and full of bacon with just a bit of crunchiness from the panko topping. We continued to make our way through the crowd to see what the other vendors had to offer. I stopped at a gourmet vinaigrette salad dressing tent, RIGHT TASTY because their samples of vinaigrette were calling my name. 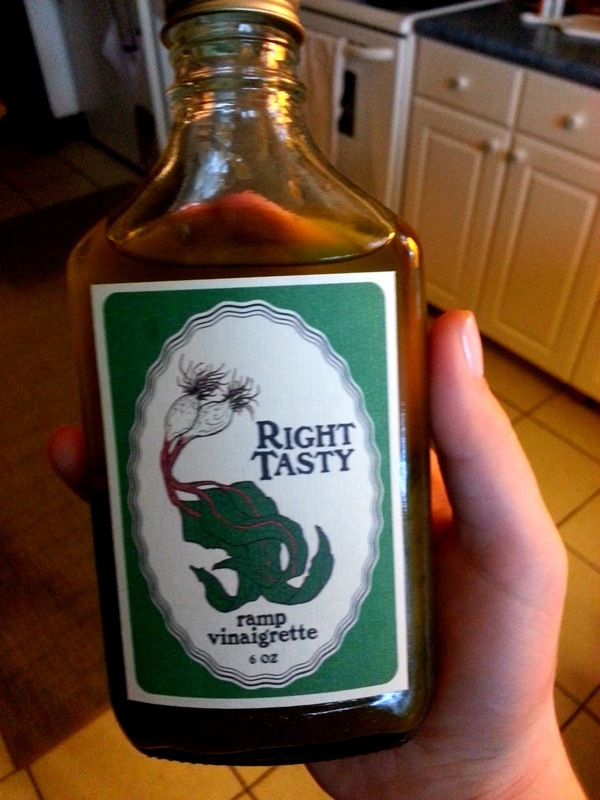 I tried their ramp vinaigrette, loved it, and bought it. This bread smelled so good and was beautifully arranged, that I just had to snap a quick photo! We passed the guys at the BROOKLYN OYSTER PARTY and I just had to see what they were shuckin' up. There were two types of oysters, but I forget which one I had (whoops). 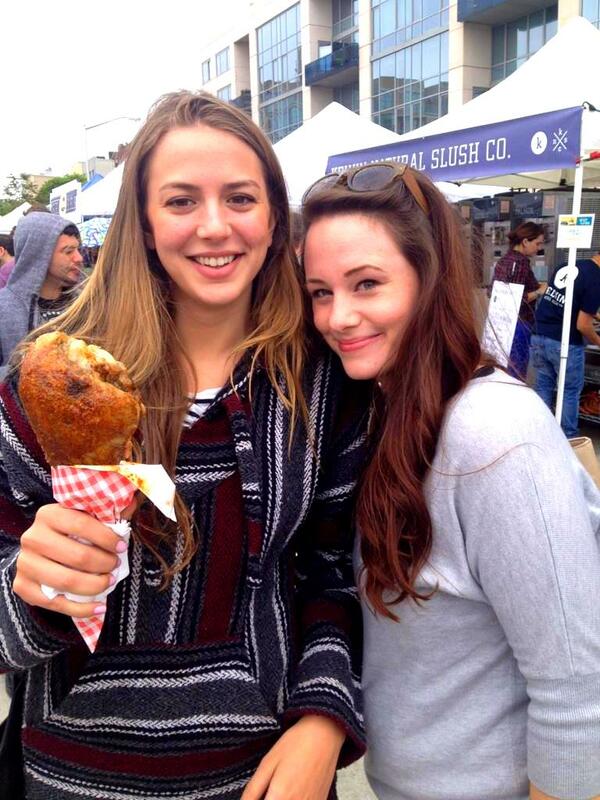 I had so much fun at Smorgasburg, I kinda wish I lived closer to the city so I could go every single weekend! If you're in the area on the weekends, I highly advise you to make your way to either location and experience it for yourself. If you forgot to click earlier, here is the link again. SMORGASBURG. Thanks for stopping by The Simple Treat! I hope you enjoyed my latest post! Hey there! I'm Kim -thanks for stopping by my little corner of the Internet.